With an increase in population and a decrease in available fuels such as wood and coal in developing countries, the need for alternative cooking methods has increased. Solar cookers are an alternative to conventional methods such as wood-fires and coal-fires. They provide usable heat for cooking and pasteurizing water, without the harmful side effects such as smoke inhalation that nonrenewable sources create. In many countries such as Haiti, Bolivia and Kenya, the need for cheap, effective, and safe cooking methods has increased due to poverty and deforestation. Solar cookers are ideal because they rely on the sun’s free energy which is abundant in many of the world’s poorest countries. Though there are good designs, more testing and improvement is desirable. There are three areas of comparison that were focused on during the course of the study. The first area of comparison is in the reflective material used. The original material is a mirror-finished aluminum Mylar. Due to the mirror finish, the reflection light is very bright and can be difficult to work over when cooking. An alternative material is a matte-finish Mylar. This material diffuses the sunlight and is not as harsh on the eyes as is the mirrored finish. The second area of concentration is on the method of containing the air that surrounds the cooker so that the cooker is kept from being cooled by convection currents. A common method is to use a clear plastic oven-safe bag around the cooking vessel. However, this method is rather tedious and awkward to use, and such bags are rarely available in developing countries. Another technique is to use a disk or window make out of a clear plastic or glass. This would make the cooker easier to use. The third main area of focus is in the cooking containers used. 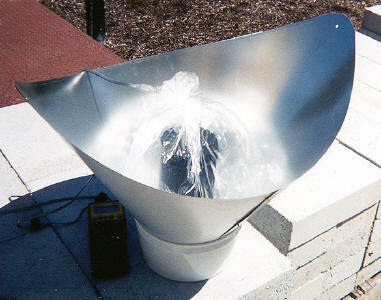 The present cooking vessel for the Solar Funnel Cooker is a black-painted canning jar . This method is also tedious and awkward. The canning jars can be hard to clean, and they can break. Design changes are tested that would allow people to use their own cookware. This too would make the cooker more convenient to use. The fourth area of testing pitted the wooden block support which we have been using for years (see http://solarcooking.org/funnel.htm) against a rabbit-wire support. 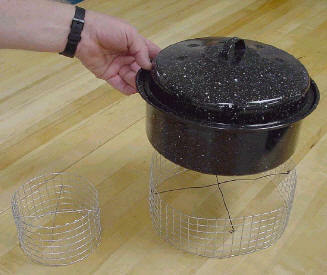 A rabbit-wire cylinder holds the cooking vessel up off the bottom of the cooker, and allows sunlight to strike essentially all surfaces of the cooking vessel, including the bottom. The second method of closing off the cooking vessel from convection currents, designed by Dr. Jones, is to place a clear plastic disk down into the funnel above the cooking vessel. The funnel used in the test was a conventional-shaped funnel  that was constructed out of thin sheet metal and aluminum-foil lined for better reflectivity. The diameter of this funnel is about 30 inches at the top, and it stands about 16 inches high. The walls also form about a 60 degree angle with respect to the horizontal. This funnel was designed to hold a larger cooking container such as a pot. The diameter of the plastic disk is large enough that the disk does not touch the top of the container. For the experiments that tested this method, a one-sixteenth inch (1.6 mm) thick Lexan disk was used. To collect the temperatures as a function of time, a Texas Instruments Calculator Based Laboratory (CBL) was used. This portable interface is capable of recording real-time data from multiple channels. The data was downloaded into a graphing calculator, where it can be immediately analyzed and graphed. From the calculator, the data can be transferred to a computer spreadsheet such as Microsoft Excel for further analysis. Due to the nature of these experiments and the low cost to purchase the CBL, this is an ideal data collector to use. A graphing calculator was used to program the CBL and to tell it what data to collect, how many points to collect, and the time period between data points collected. Since the CBL does not have any internal programs for data collection, a program must be written into the graphing calculator. There are ready-made programs that can be uploaded into the calculator, or a custom program can be made to fit the needs of the test. The program that the CBL used allowed multiple thermocouples to collect data simultaneously . To ensure that the thermocouples were calibrated against each other, both were run on the same constant temperature sample in very close proximity. Both temperature probes agreed to within 0.21OC of each other. For these experiments, this temperature difference was considered to be acceptable. Each experiment was conducted on the campus of Brigham Young University during mid-day, usually between 11:00am and 2:00pm to ensure that the sun was close to being directly over-head. This allowed as much sun light as possible to enter the solar collector. Each experiment included several steps, as listed below. On the morning of each test, the designated volume of water was measured out and poured into the cooking vessel. This volume ranged from 0.6 liter for one-quart jars, to 1.2 liters for half-gallon canning jars. For simultaneous testing, the same amount of water was poured into each container. The temperature probes were wired thru the holes in the lids of the containers and secured about 13 mm into the water. For comparative tests, the probes were placed the same depth into the water to ensure that the probes did not read different measurements due to depth-related temperature differences within the containers. To enable later analysis; the time, ambient temperature, and solar irradiance were also noted and recorded. These numbers gave a reference point for each test. Each cooker that was to be tested was then completely set up. The temperature probes were secured thru the lids, and the jar was placed into the clear oven bag– supported by a wire cage. Each bag was inflated so that no part of the bag touched the sides or top of the cooking container. The cord from the thermocouple to the CBL was passed thru the top of the bag, and the bag was tied off with a twist-tie. The test began once both cookers were completely ready and the CBL had been programmed. Care was taken to block the sun from radiating directly onto the cookers until both were ready to begin. This ensured that the water in both cookers started at very nearly the same temperature. Most tests were set up to collect one data point every four to five minutes, for up to two hours. This allowed the cooker temperatures to reach maxima and then remain at a nearly constant temperature. Once a test was complete, the cooker was disassembled and the data downloaded into the graphing calculator. Though the graphing calculator does allow analysis, a spread sheet such as Microsoft Excel is easier to use. Thus, the data from each test was downloaded from the calculator into Microsoft Excel. The elapsed time (in seconds) and the corresponding temperatures were listed next to each other. A graph of temperature versus time was made–the time being the horizontal axis–for each test. For comparative tests, the temperature versus time data for both cookers was plotted on the same graph. As a reference, a trend-line was fit to the linear portion of the graph, along with the linear regression and the coefficient of correlation (R2). It is important to have a coefficient of correlation close to one, as this is how close the linear regression fits the data. In a separate column, the temperatures were again listed, however only from 30OC to 70OC. The change in temperature ()T) for every ten or twelve minutes was found and logged next to the temperature column. The power output (in Watts) of each cooker could then be calculated. Where ±)P is the total error in the calculated error, )mw and )mc are the error in the mass of the water and container respectively, )Tp is the error in the temperature difference, and )t is the error in the time interval. The error was found only for the average change in temperature()T), rather than for each )T as the power output is. Since the power output is dependant on the amount of energy in (from the sun), the cooker efficiency is a good reference to calculate. To find the efficiency, the total amount of (local) solar irradiance must be known. This should be given in [W/m2], so the wattage in can be found. 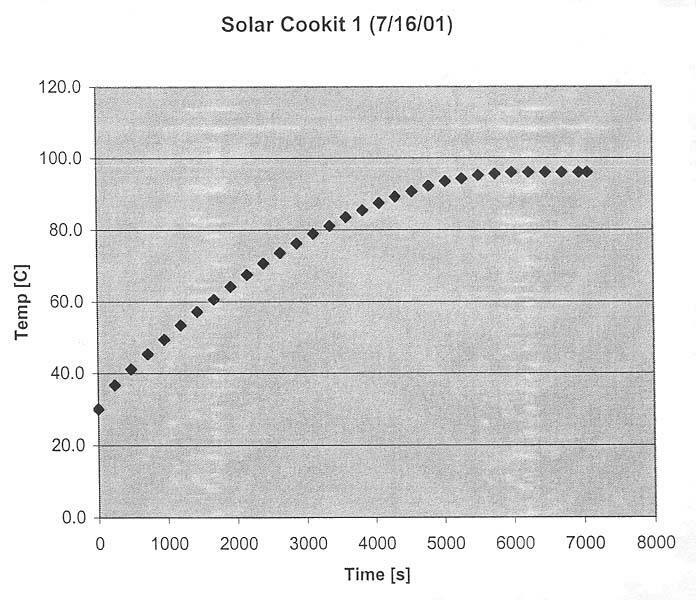 To find the power in, the area of the cooker perpendicular to the sun’s rays was multiplied by the solar irradiance to give the amount of power that was being collected by the cooker. Since the Solar Funnel is able to be kept on track with the sun, and since the tests were done during mid-day, no angles were necessary to calculate. The efficiency is simply the power output divided by the power input, multiplied by 100 to give a percentage. The solar irradiance for each test was supplied by the Department of Physics and Astronomy weather station at Brigham Young University in Provo, UT, where the tests took place. Matte vs. Mirror: Several tests were conducted on the matte vs. mirror finishes. In each test, the matte finish outperformed the mirror finish. On 27 July, 2001, a matte funnel and a mirror funnel were simultaneously tested with 650mL of water. The average power output for the mirror finish was 46.4 W ± 1.7 W, while the matte funnel put out an average of 59.4 W ± 2.1 W. The efficiency of the mirror funnel was 15.8%, while the matte was 20.2% efficient. The following graph shows the temperatures reached by the matte and mirror funnels. Channel 1 (Ch1) was the mirror finish, and channel 2 (Ch2) was the matte finish. This shows that both funnels peaked at about the same temperature–97OC (207OF). The matte funnel peaked in about 76 minutes, whereas the mirror funnel peaked in 96 minutes, twenty minutes later. Though this perhaps a tolerable time difference for actual cooking, it is substantial. Every matte vs. mirror test performed in a similar way. These results are due to the way the matte funnel reflects the sun’s rays. The mirror finish seems to focus a strip of light onto the cooking vessel more than the matte finish does. As a result, the matte finish diffuses the light more and the cooker is heated more uniformly. This is good, since the matte finish is easier to work with, delivering much less glare to the eyes. Comparing the two graphs above, we find that the Solar CooKit performed very well, comparably with the Funnel Cooker. We should note that we used in both cases a canning jar (pressurized) supported by a wire stand. We found that the wire stand improves the performance of the Solar CooKit significantly and hope that this support stand will be used in countries where the Solar CooKit is in use. In tests where the use of the clear plastic disk was tested against the oven-bag, an aluminum pot was used in the disk-setup. In these tests, the cooker with an oven bag outperformed the cooker using a plastic disk. On 10 August, 2001, a test was run that compared the disk/pot setup against the oven-bag/jar setup. Both cookers follow similar heating paths with time, but the oven-bag/jar did slightly better. Due to the higher mass of the jar compared to the mass of the aluminum pot, and the much higher heat capacity of the water, the average power output for the oven-bag/jar was 39.8 ± 1.4 W, while the disk/pot put out 30.3 W ± 1.2 W. The efficiency of the oven-bag/jar was 14.7% and the efficiency of the disk/pot setup was 10.4% for this test. This is also partly due to the pressure-cooker effect that the canning jar produces. Though this is a considerable efficiency difference, the disk/pot setup did very well in subjective tests where food was actually cooked and tasted. In all cases where the disk/pot setup was used to cook food, the food cooked in about the same amount of time. The ease of the disk/pot setup is also an important consideration. Overall, in tests where food was cooked, the disk/pot setup was preferred over the oven-bag/jar setup. As many countries are depleting their natural resources due to increased population and the resulting deforestation, methods other than burning wood are needed to cook food and pasteurize water. Solar cookers provide a sustainable technology that relies on the sun’s free energy. We report several advances to make them better. The need for cheap and effective solar cookers is very great and growing. Several areas of research were explored in 2001. Two finishes were tested for the reflector, a matte finish and a mirror finish. The benefits of the matte over the mirror finish are 1) The matte finish is easier to work over because the sun’s glaring reflection is diffused, and 2) the matte finish out-performs the mirror finish in temperature vs. time tests. The method of closing off the cooker from convection current was tested and compared with an alternative method–a clear plastic disk. The use of a pot rather that a canning jar was also tested. Though the present oven-bag/jar method does outperform the disk/pot method, the disk/pot method is easier to use and seems to be nearly as efficient. Finally, we showed that a wire-mesh stand is a considerable improvement over the use of a wooden block or other opaque stand for the cooking vessel. We join with our fellow researchers around the world in pursuing further development of solar cookers, particularly to benefit people in developing countries.
. Jones, Steven E. et al., BYU.
. Wattenberg, Frank. Montana State University. 1996.